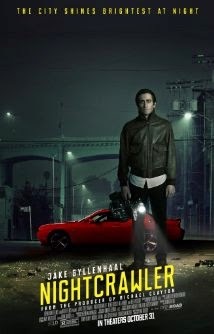 Nightcrawler was not your typical movie. Unlike action, drama, superhero, horror and other popular genres, this was a new flavor and I was glad I gave it a try. Jake Gyllenhaal plays a poor young man named Louis Bloom who goes by Lou. He has no job and gets by from stealing metal off of fences and other scraps to sell. Lou soon realizes he needs more money and happens upon an accident int time to see a camera crew video tape it for the news. Camera in hand, Lou hires an almost-homeless kid named Rick (Riz Ahmed) to be his navigator. Lou begins to make a name for himself and gets the really spicy news and best shots, helping one station raise its ratings. Eventually, he come across a scene the cops haven't reached yet and gets the best story and footage which pays him big. To extend the story, Lou cuts out a piece of the footage for later. Rick thinks it's not right and wants out, but Lou is loving what he's doing and if it grows to a bigger story, they'll both get a good chunk of money. The ending has a little twist and involving Rick, the news station, and two detectives who are wondering what else Lou might be hiding from the footage. Again, this movie was different and I was glad I watched it. If you're in the mood for a change go see it, if not, it's still worth a rent.